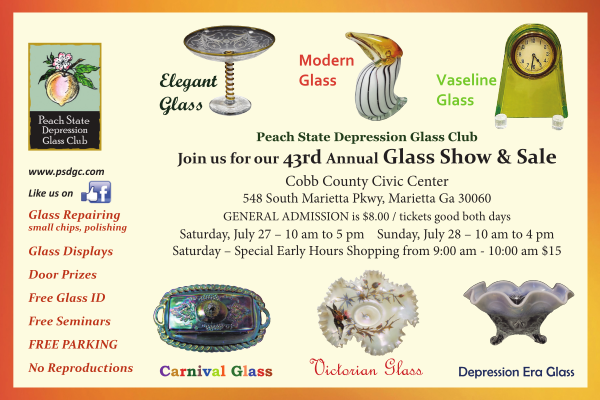 The Peach State Depression Glass Club sponsors this annual show and sale to draw attention to the beautiful American made glass from the 1800s through the depression era and into the mid-century - glass that can be used to decorate your home. Lamps, vases, candy dishes, console bowls and candlesticks all add charm to open spaces; whereas stems, dishes, and serving pieces provide beautiful and impressive table settings for everyday use or on festive occasions. We invite 28 national exhibitors to share their collection of glass, pottery, kitchen-ware and knowledge with you. They can help you find that sought after piece for your collection or provide you with a nice gift for a friend. (Yes, the merchandise is for sale!) The proceeds from the show is used by the club to support student scholarships in the fine arts department/glass blowing at Georgia Southwestern University as well as museums which showcase this fine glass across the nation. Proceeds from this show go to support Student Scholarships in the Fine Arts Department (glass blowing) at Georgia Southwestern State University, Americus, GA. It also provides some support to National Depression Glass Museum in Wellington, KS, the Museum of American Glass in Weston, WV, and the Houston Museum in Chattanooga, TN. This show is always held the fourth weekend in July and features 28 prominent dealers from across the nation. Don’t miss it on July 27 and 28 at the beautiful Cobb County Civic Center – Hudgens Hall – 548 South Marietta Parkway, Marietta, GA 30060. 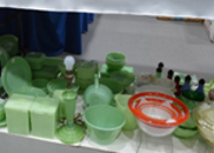 The Peach State Depression Glass Club’s display for the 2018 Annual Collectible Glass Show and Sale will feature kitchenware found in a typical kitchen in the 1960’s. Was it in yours? Your mother’s? or Your grandmothers? Come to the show and see what you can find and remember. You will see Corning Glass Company’s Pyrex – clear and blue, Anchor Hocking’s Fire King - Jadite, McKee Glass Company’s GlasBake, Frye, and much more. Our four-seminars this year will focus on special glass that was used in the kitchen or decorated the home at this time. 11:00 am - “Everglade – Cambridge Glass Co.” by Paula Mahoney of (Booth # 14) Mary’s Momentos and by Ron Mandigo of (Booth #6) Dennis Bialek and Ron Madigo’s Glass dealers exhibiting in our show. Most of us are familiar with the clear beautifully elegant and etched glass by Cambridge Glass Co. However, this company produced an unusual line of glass in the 30s, 40s and 50s which featured about eight different patterns of flora and fauna seen in the Everglade Swamp. Hear the story of the pattern “Everglade” and see the many colors and designs in all their glory. 12:30 pm - “Moon & Stars and So Many Colors - L.E. Smith” by Joy Uthe of Ginger Bread Antiques (Booth # 21) glass dealer exhibiting in our show. L.E. Smith Glass Company was established in 1907 in Jeannette, Pennsylvania and is still producing glass today, in patterns from “EAPG to Moon and Stars.” They have been known for their brilliantly colored glass from 1920 till the present. Cone join Jodie as she shares her knowledge of the many sides of this American treasure! Come learn about the unique decorative ware that brightens any home décor. 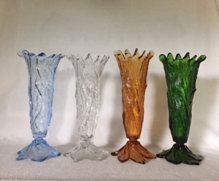 2:00 pm - “Moonbeams Caught in a Web of Glass – H.C. Fry Glass Co.” by Bob Dahlhofer, a collector, Vice President of PSDGC, and resident expert. This company produced a lot of beautiful opalescent ovenware and other kitchen pieces during most of the 1920s. Bob will share some of the company history and entertain you with pieces from his collection. 1:30 pm - “Pyrex” by Cynthia Hillman, Collector, past President of PSDGC, past Member-at-Large of the NDGA. 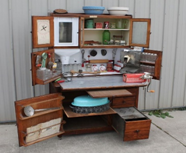 Learn the interesting story about kitchenware that everyone has in their kitchen both old and new from Cynthia as she shares a few pieces from her collection. The Civic Center provides ample space for the 28 invited national exhibitors to share their collection of kitchen-ware, decorative glass, table settings, and pottery in magnificent displays. It is a place for everyone – come, see, learn, and shop. You will find a large assortment of American-made glass from the 1880s through the 1970s. Need a rare or collectible piece of depression or elegant glass or just something for yourself or a gift for a friend (early Christmas shopping)? Seek and you will find! These dealers are the most friendly and helpful people on earth and will share their knowledge with you. Ask questions - get answers! Our knowledgeable club members provide Glass ID both days during the show. Attendees can bring three pieces of glass to be identified (at no charge). We ask that you abide by this request as we want all show attendees to have the opportunity to take advantage of this service. The Glass ID area will be located by the elevators on the upper level at the back of the arena. John Forrester will again be providing glass repair service in the room on the upper level back left. He can polish out small chips and smooth rough edges. He cannot put broken pieces back together. Bring your items and he should be able to complete the work while you shop. Price of repair depends on number of pieces and difficulty of the task. Registered guests are eligible for door prizes given through out the weekend. Make sure you receive the card from our hostesses, complete the information, and drop it in the Peach Bowl for the drawings. These prizes are given throughout the weekend and provided by the dealers and club members. They are nice pieces of glass for you to treasurer, however you must be present to win so stay and shop with us all day for the best chance.